Are standing (established, valid, existing). The names in Hebrew יהושוע and ישוע are the same derivation, and can be used interchangeably for the same name. This is evident because in Zechariah 6:11 and Ezra 3:2 the two forms of the name are used for the same person. And you shall take silver and gold, and you shall make crowns, and place [them] upon the head of Joshua the son of Jehozadak, the High Priest. And Jeshua the son of Jehozadak arose, and his brethren the priests, and Zerubbabel the son of Shealtiel, and his brethren, and they built the altar of the God of Israel, upon which to offer up burnt offerings, as it is written in the Torah of Moses, the man of God. 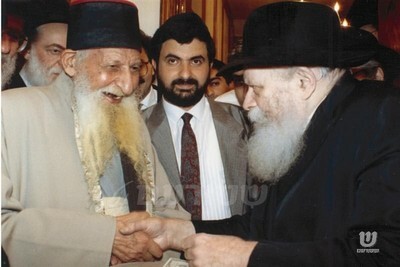 Leading Rabbi Yitzhak Kaduri died from pneumonia aged more than 100 years old. 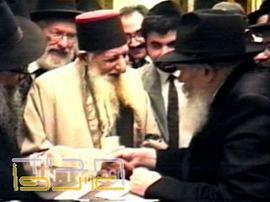 a honored leading Rabbi, died Saturday January 26, 2006 in a Jerusalem hospital. “All Israelis are one family today, mourning the man who throughout his life prayed for the people of Israel," Rabbi Eli Yishai said. Kaduri started out as a modest bookbinder, and had become one of the best known Rabbis in the country. He was born in Iraq, and immigrated to Israel at the age of 17. He studied in a Jerusalem Yeshiva, and was a student of prominent rabbis who worked in the capital at the start of the previous century, including Salmon and Mordechai Eliyahu. 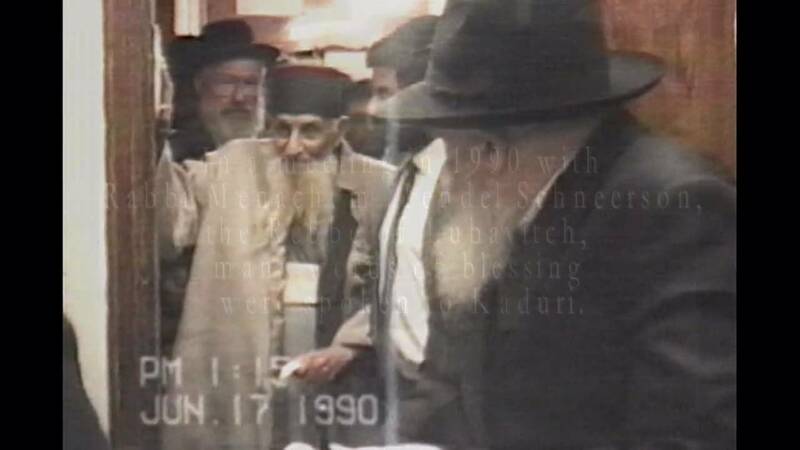 The Rebbe Eliyahu told Rabbi Kaduri that "kaduri" connotes "kadur haaretz" in Hebrew it means "globe" and that his influence should be felt around the entire globe. 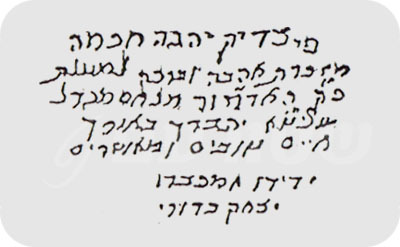 In 1991 Rabbi Kaduri participated in a farbrengen in Kfar Chabad in honor of the Menachem Schneerson’s birthday and announced that "from here I am sending the Rebbe a present of a silver plate – a souvenir of love and I also engraved some words (see below). 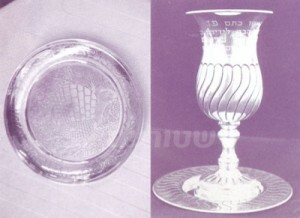 A few years before when the Rebbe turned 87 that Rabbi Kaduri sent the Rebbe a silver cup. 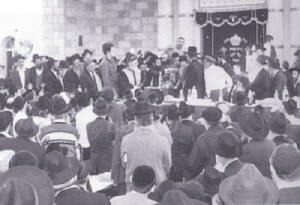 When the Rebbe received his gift he took it to the Ohel and when he came back there was a farbrengen. 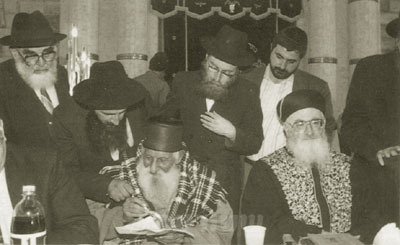 Rav Kaduri was considered to be a TSADIK צדיק by Rebbe Menachem Mendel Schneerson. reveal himself to Kaduri and tell him his name before Kaduri would die. This was very significant because it was a confirmation of the prophecy that Rav Kaduri had received from the great Rebbe Yosef Chaim (Ben Ish Chai) of Baghdad in 1908. The prophecy said the same thing: That Rav Kaduri would meet the Messiah המשיח before he died. Rabbi Kaduri told his Yeshiva that the Messiah המשיח had revealed himself to him and that he had met with him. 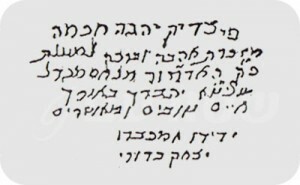 He wrote the name of the Messiah המשיח in a note that was not to be opened until one year after his death. The name is the same name that the Angel Gabriel גבריאלgave to the Messiah המשיח before the time of his birth in Israel. This is the name ישוע or Yeshua. This is the name Jesus in English. But while he thought about these things, behold, an angel of the Lord appeared to him in a dream, saying, "Joseph, son of David, do not be afraid to take to you Miriam your wife, for that which is conceived in her is of the Holy Spirit. And she will bring forth a Son, and you shall call His name Yeshua ישוע (Jesus), for He will save His people from their sins." Now in the sixth month the angel Gabriel גבריאל was sent by HASHEM to a city of Galilee named Nazareth, to a virgin betrothed to a man whose name was Joseph, of the house of David. The virgin's name was Miriam.. And having come in, the angel said to her, "Rejoice, highly favored one, the Lord is with you; blessed are you among women!" But when she saw him, she was troubled at his saying, and considered what manner of greeting this was. Then the angel Gabriel גבריאל said to her, "Do not be afraid, Miriam, for you have found favor with HASHEM. And behold, you will conceive in your womb and bring forth a Son, and shall call His name Yeshua ישוע. He will be great, and will be called the Son of the Highest; and the Lord G-d יְהֹוָה אֱלֹהִים will give Him the throne of His father David. And He will reign over the house of Jacob forever, and of His kingdom there will be no end."